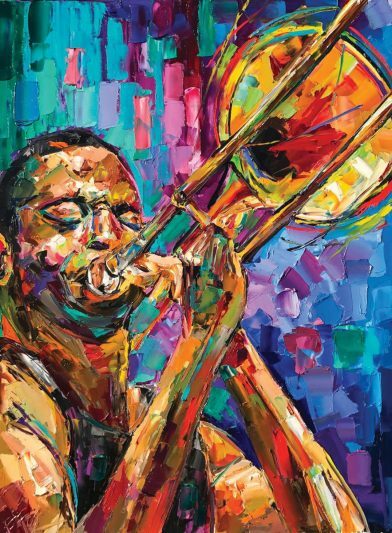 TROMBONE SHORTY & ORLEANS AVENUE: SUNDAY, MAY 7—ACURA STAGE, 5:35 P.M.
Over the past half-century the New Orleans Jazz and Heritage Festival has defined what it means to be New Orleans in a manner rivaled only by Mardi Gras itself. The event has spawned a music festival culture in the city, both with its spinoffs and its imitators, that now runs more or less year-round. 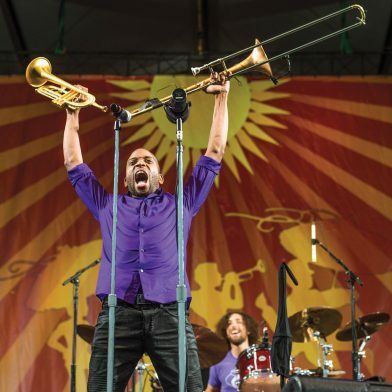 Though it’s grown in the twenty-first century to include a who’s who of mainstream popular music artists from outside the city, Jazz Fest’s basic content remains the best of what New Orleans has to offer. A few charismatic figures have given the festival its core identity over the years—Professor Longhair’s rediscovery and revival was a focal point of its mission statement and an early signifier of its identity. Through the 1980s and 1990s the Neville Brothers ruled the Fest from their annual finale at the biggest stage, now known as the Acura stage. The Nevilles eventually abdicated that musical throne, but a new King of Jazz Fest, a child of Treme, was waiting in the wings to take over from the Uptown rulers. For the fifth year in a row the last statement at Jazz Fest will come from Troy Andrews, a.k.a. Trombone Shorty, and his astonishing Orleans Avenue band—guitarist Pete Murano, drummer Joey Peebles, bassist Mike Ballard, baritone saxophonist Dan Oestreicher and saxophonist BK Jackson. The group has fresh material to showcase with the just-released Parking Lot Symphony, Shorty’s first album for the venerable Blue Note label. The recording is an evolutionary step for an artist who defies categorization through his assimilation of rock, funk, hip-hop, pop and the entire tradition of New Orleans music that runs through a family tree that flows back through the great Jessie Hill and beyond. The year Shorty was born, 1986, Jessie Hill played the Fest. It wasn’t long before young Troy followed in his grandfather’s footsteps. In 1990 Shorty made his first JF appearance at age four, sitting in with Bo Diddley. Shorty has been at every Jazz Fest since, except for 2006 when he was on tour with Lenny Kravitz. 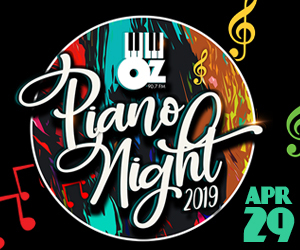 He sat down to talk about Jazz Fest and the new album right after completing a national tour with the Red Hot Chili Peppers. Parking Lot Symphony has a lot of different feels to it, from rock to funk to hip-hop. Music is life. When you go to a different neighborhood, or be around different people, that’s how I look at music also, so when I’m playing in a rock arena, or touring with country bands and playing with them, I like playing with people who are good at their style of music. I’m just like a sponge, soaking everything that I can in. If you couldn’t keep learning, life would become pretty boring and you’d become stagnated. So I’m always intrigued to learn as much as I can about all the styles of music. With that attitude it just comes about. When you first started playing with this band you were taking the lion’s share of the solos, but over the years it’s gradually become more of a group sound. Coming up with some of those guys, at first they didn’t have as much experience as I had as a kid, so I wanted to develop with them—you know so it’s definitely a band effort, everybody is just out to play and I definitely have to give a lot of credit to them. It’s not leading them, we all lead each other, so sometimes I might lay back in rehearsal and our bass player Mike or Joey, our drummer, he might take over the rehearsal and I try to sit back and catch what they want me to do and we just do a collaborative effort. I’m just happy that not only are we able to grow as a band but we are growing as men together and that’s a bond mentally and spiritually that helps each and every one of us. It’s not just me. I may be the face or whatever but everybody has an equal contribution to this band and I think that’s part of the success we’ve had. The show I just saw at the Capitol Theatre in Port Chester, New York was phenomenal. You guys hit the stage and didn’t stop for a moment all the way through. Playing all those rock shows and being around the Chili Peppers and the Foo Fighters that’s just a natural energy. I have a lot of energy and I bring the band with me. That also comes from playing in the streets—all those four-hour parades we could never take a break. So that type of energy just translates to the stage. We all grew together and studied together and we still study together, listening to all the great musicians. We talk about it and break some things down even when we’re on the bus. We check out different bands and different things and the next thing you know we incorporate that into what we’re doing. It’s a process and I’m just blessed to be with a great group of musicians and also grow together. We are open-minded to different things. We listen to each other. We never throw anybody’s idea out. Did you approach making this record any differently from your other recordings? Moving over to Blue Note I just had enough time to sit back and plan it out. The last two records we would go into the studio for two weeks, then go back on the road for six weeks. This time it just came to me naturally. When I felt I had some stuff I went into the studio by myself before I brought the band in. So I went into the studio for about two weeks. I had a circle of instruments—drums, tuba, trombones, trumpets, guitars, bass—and I surrounded myself, just me and the engineer and I’d just go in and put down some ideas and get them as close to done as I could before I brought them to the band. I had to get out of touring mode and just let things come to me and hit me. You used producer Chris Seefried (Fitz and the Tantrums, Andra Day) this time. How did he get involved in the project? At first it was just me and engineer Misha Kachkachishvili at Esplanade Studios for about two weeks straight. I had about 20 ideas by myself. Some of them were completed; some needed a lot of work. I let Chris listen to the songs. I had a batch of them that I thought were strong, and there were some where he said we can do something with this. We brought the band in and started applying vocals and melodies because I had just put down a basic foundation and I might have had some things where I was humming. Chris heard some of the songs and he went into the studio and he just added some things. He would say ‘I’m not trying to change this, but if you like it…’ He added some different chordal structures and some lyrics and some melodies, it was a real collaborative effort. After he made some changes I wanted to give him songwriting credit because what he added wasn’t there before. It wasn’t like he was trying to write to write. He added some things to it that made the sound pop to a different level. He wrote lyrics and a melody over the music I had put down. He gave me like two or three different chords right before the hook comes in. That buildup right there I didn’t have that and I thought it added to the tune, made it that much more impactful and emotional. You brought in some other writers as well. How did Alexander Ebert get involved in the title track? We were hanging out in L.A. I knew his dad, and I knew he lived in New Orleans. When it was time to start writing I just reached out to him and we went over to the studio. I was playing piano on that session and I came up with that vibe, the main melody. A week later he came back with the lyrics and the title. Everybody in the studio was smiling. Whenever I get on piano I just start playing. I came up with that phrase and we just kept going. I put some horn parts on and it all developed into a really cool piece. We were in this rehearsal room and I showed him some chords on the piano. We worked together on the lyric. What we came up with was much slower than what is on the record. I changed the groove, keeping the piano part. The theme was his. He’s a pretty successful artist on his own. We see each other around all the time. I had a hook and I asked him to put something around it. He was like a machine, he listened to it and then he finished the lyric and the story in less than an hour. He’s a great songwriter. On “Where It At?” you used Kevin Griffin from Better Than Ezra. My manager sent it out to Kevin. I’m a big fan of Better Than Ezra. I actually bought their studio in New Orleans. I just gave him the music and I let him come up with the melody and the lyrics to it. Keith is a friend of mine, more like family. He grew up with my brother. We actually call him ‘Like a Dog.’ That skit in there, I called him on the phone because we had the working title ‘Like a Dog’ because everything he say is ‘Like a dog.’ You ask ‘Keith you wanna go get something to eat?’ And he’ll say ‘Like a dog.’ ‘How did you like the concert?’ ‘Like a dog.’ When he texts me in the morning, instead of saying good morning it’s ‘Like a dog.’ That’s a really popular saying in the Seventh Ward of New Orleans where he’s from, St. Bernard. Everybody from different neighborhoods have their own little sayings. I called Keith on the phone so that Chris could talk to him and the first thing he said was ‘Like a dog’ and everybody just fell out. The first song we recorded was ‘It Ain’t No Use’ ’cause we already had that under our belt. That little dirge I created is also inside of ‘It Ain’t No Use.’ So that became like the theme for the whole record. The great arrangement of “Here Come the Girls” keeps the feel of the original but adds a Trombone Shorty twist. Allen Toussaint is one of our treasures. I had to keep that theme because that march and that horn figure is such a big part of that. When I got to the verses I wanted to switch it up a little bit and make it a little more Meters like. Ivan Neville is playing the piano on that so he put some funk in there and he took it to another level. That verse part is something I came up with during a live show. My bass player was kind of outlining what Mr. Toussaint had written so we decided to outline the verse so that when we came back to the main theme of the tune it would be that much bigger. Speaking of Ivan, you use his bassist Tony Hall on this album for the bass parts. He’s not my regular bass player. I don’t think Ivan would let that happen. Tony’s on the whole album. Mike is our bass player but Tony played on this record. I’ve always loved Tony’s playing. We always wanted to work together. He’s like an encyclopedia. Last year you released a children’s book, Trombone Shorty, in which you talked about your own childhood. Did you learn anything from looking back on your life? It gave me perspective. Trying to rethink what I was going through back then as a child. There were a lot of things I actually couldn’t remember but when I talked to my cousins and some of my childhood friends, they remember some of these things and remind me about them. I tried to remember as much as I could. It did give me perspective on how much fun it was growing up and how music was my life, as it still is, and how it was guiding me at a young age. Did your childhood become more vivid to you? Yeah it did, it became more vivid when I was writing it down. When you’re a child you can’t remember everything from back then, but I remembered certain things. Like I remember it being extremely hot that first Jazz Fest and I remember walking down there. I remember moments without being able to remember the entire thing. Music can carry those memories. I can be playing a certain song and it will take me back to my childhood. Certain songs that we play take me to a particular place in time. 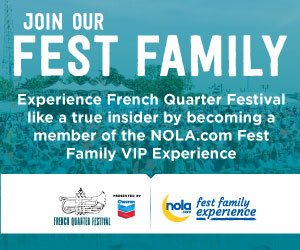 What did you think about Jazz Fest when you were a child? Did you know it was something special before you went? I always knew that Jazz Fest was coming around and I would be able to get some sno-balls and all kinds of food and I could play with my brother James’s band. As a kid I always looked forward to it. I couldn’t explain the feeling that I had but I just knew there was something exciting going on. I was able to hear a lot of music. I got to march in some of the parades that we had at the Jazz Fest. My mom would go to see the artists and musicians that she liked and take me with her. I just remember it being a really exciting time every time she said we were going to the Festival. I marched with the New Birth Brass Band and the James Andrews All Star Band. James went with me everywhere when we played, if we played on the street, or if we played at the Jazz Fest. If he played on the stage he had me right on his side. There’s a picture my momma has at her house and it’s me and James playing side by side at the Ray-Ban Stage. I remember that I played that stage a couple of times and every time I played they gave out free Ray-Bans. But James had me up on all his stages, and if he was a special guest with someone he had me with him. Your first year leading your own band was 2002. My band played at the Fais Do-Do Stage that year, and then we played at the Jazz Tent the next year. I think we blew the speakers out on the first song. I played two trumpets. I had two trumpets and I was working on some harmony. I haven’t done that since that time. Jonathan Batiste was in your band then. Yeah we grew up together at the Jazz Camp and at NOCCA. I used to have to force him to come out of the house, he just wanted to practice all day. We’re really like brothers. He was in my band up until he went up to New York to go to school, right before the storm. You also played with the Nevilles that year. I’ve been playing with the Nevilles since I was 12, 13 years old. They would bring me and [Cyril’s son] Omari up there and play. Aaron still calls me Trumpet Slim to this day. Is that any relation to “Tripped Out Slim” on the album? Tripped Out Slim, he was a real friend. He passed away last year. That’s just a song in his honor because some of his favorite music was Rebirth Brass Band and James Brown. When I was writing that song I wanted to put those two together. He was like an uncle to me. He looked after me up until the day he died. He called me every day, since I had a cell phone in seventh grade, there’s not one day he didn’t call. Did you meet Lenny Kravitz when he played the festival in 2004? No. I met him when I was 18 years old. I had just finished high school. A mutual friend of ours told me he was looking for some horn players. I was playing with my band and he flew me in the next day. I had no idea I was auditioning for a band, I just thought I was making a gig. I went up there and played and I remember my lips were killing me because I had played like 12 hours the day before. I had a gig at the House of Blues, I played a wedding for four hours and I was in the studio with the Lil Rascals. I flew up right after all that. So we go into the rehearsal, he hums some stuff in my ear; I’ll catch that and make up something out of it. So after that he went in the back with the whole band and he came out and said you’re in the band. I was like ‘What band am I in?’ So he called my mama and told her. I stayed in Miami for two or three weeks rehearsing with the band. I had to go home and pack because when I flew up there I didn’t bring any clothes because I thought I was coming back the same day. Since you returned from the Lenny Kravitz tour after Katrina you’ve been all over the place at Jazz Fest. I played a bunch with the Lil Rascals and New Birth, New Orleans Social Club. I played with lots of people at Jazz Fest. I think I’ve played at every stage at the Jazz Fest. It’s fun. I get complete joy out of being able to play with different bands and different styles of music. That’s one of the happiest moments. I’ve shared the stage with Sheryl Crow, Zac Brown, Little Big Town, I played on Dierks Bentley’s last album. I’ve played with Earth, Wind & Fire, the Foo Fighters and B.B. King. If nothing else happens in life and I’m just able to share the stage with great musicians in different genres of music, that’s all that matters to me. What is your favorite Jazz Fest moment? Always playing with the Neville Brothers. And now you’ve taken over their spot closing out the festival. This will be your fifth year. Wow, I didn’t realize it was five years. You know that was something that I actually dreamed of. Myself and Omari, we always wanted to join the Neville Brothers and be a part of it. We used to dream as kids when we were like 13, 14 years old that we could someday take over the Neville Brothers band. I remember telling Omari ‘One day we’ll be just like them and play the festival and close it out.’ Next thing I know years later it really happened. That’s a real dream come true to take over that closing spot and have the Nevilles bless me and help me grow to be in the position I’m in. New Orleans loves New Orleans so it always works out.